Giuseppe Taormina has performed in Italy, Europe, and the United States, as well as a worldwide tour of the Middle and Far East with the "Ambassadors of Opera". He was born in Palermo, Sicily, Italy. He started voice training at a very early age and began performing in Sicily. When he arrived in America, he immediately auditioned for the Metropolitan Opera Company, where he was accepted into the Young Artist Program. He received two scholarships as primo tenore while at Hunter College. He won the leading roles in La Traviata, Tosca, and Cavalleria Rusticana, which are now all favorites among his repertoire. Most notably, Mr. Taormina has received the very prestigious honor of Necklace Knight, "Cavaliere di Collona." The noble title of Saint George in Carinzia Supreme Military Order, bestowed upon Mr. Taormina, is the only one in the United States. Mr. Taormina's operatic appearances include performances with the Philadelphia Opera, The New Jersey Performing Arts Center (under the direction of Maestro Alfredo Silipigni), The Metropolitan Repertory Ballet's "An Evening with Verdi", The Tribecca Performing Arts Center, The Merkin Concert Hall, The Waldoff Astoria Hotel in New York, The Garden State Arts Center, and at the world-renowned Carnegie Hall. 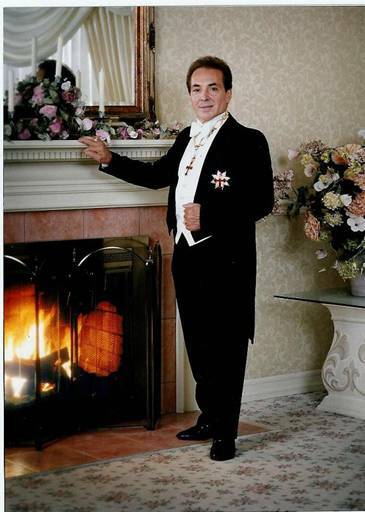 Mr. Taormina has given command performances for Kings of both Yugoslavia and Bulgaria, also Imelda Marcos, the former First Lady of the Philippines. He recently traveled to St. Croix, in the Virgin Islands, where he sang in concert in a Castle, hosted by Countess Nadia De Navarro. Mr. Taormina, remembering his roots, has given a command performance at Carini Castle, his hometown on the outskirts of Palermo Sicily. Mr. Taormina has performed in concert, and at cultural, civic, and charity events across the USA. Among these were performances at: The Hotel Plaza, Milford Plaza, Westchester Theater, several Atlantic City Resorts & Casinos, the Wisconsin Arts Festival in the Park, The Asbury Park Convention Hall, The 15th Annual Juniper Park Concert Series, Shea Stadium, The Lakewood Theatre, and Casa Italiana Zerilli-Marimo Theatre. He was honored to sing for the Mario Lanza Society, The Beniamino Gigli Memorial Concert, and two events marking the 100 years anniversary of Enrico Caruso's Metropolitan Opera House debut. Mr. Taormina was honored to sing for The Italian Heritage and Culture Council Chamber at City Hall, in NYC, for the Italian-American State Legislators, and the American Parkinson's Disease Association. Mr. Taormina sang at masses that were celebrated by Cardinal Egan in cathedrals throughout the Vatican and Rome. Mr. Taormina sang at a memorial ceremony in Washington D.C. for Constantine Brumidi, who was known as "The Artist of the U.S. Capital". He has also sung at the Casa Italiana in Washington D.C.. Mr. Taormina was honored to sing in commemoration of 100 years of Order Sons of Italy in America. Mr. Taormina's powerful voice expresses his passion for music, while his talent, warmth and joy of performing are evident to live audiences. He has recorded three albums and, most recently, CDs "King of High C" and "Verissimo Tenore", on which he sings his favorite operatic arias and beloved, classical Neapolitan and American love songs. Mr. Taormina's powerful voice expresses his passion for music, while his talent, warmth and joy of performing are evident to live audiences. The Musicians Club of New York's 2016 Joseph H. Conlin Gala, Saturday, May 7, 2016, Liederkranz Concert Hall, New York City. Video by Paula and Chris Argondizza.